Today, the “Långmarken” wind farm in Kristinehamn, Sweden - backed by the EIB and Mirova, and promoted by Eolus Vind - was officially inaugurated at a public event in the presence of the owners of the wind farm. Mr. Kenneth Johansson, county governor of Värmland, was one of the prominent speakers at the inauguration. Långmarken was the first project in Sweden that the European Investment Bank financed under the European Fund for Strategic Investments (EFSI) which is at the heart of the Juncker Commission’s Investment Plan for Europe. “We are very pleased to be a part of helping both Mirova and EIB to make a long-term investment in the Swedish wind market. It shows an important commitment to renewables and a sustainable development. We look forward to the continued cooperation with Mirova and EIB” says Eolus CEO Per Witalisson. The wind farm comprises a total of 8 Vestas V126 3,3 MW wind turbines in a project developed and constructed by Eolus, one of the leading wind power developers in the Nordics. 6 of the turbines have been acquired by EIB and Mirova-Eurofideme 3, a renewable energy fund managed by Mirova, an affiliate of Natixis Global Asset Management fully dedicated to responsible investment. They own, through a common vehicle, 90% of the shares while Eolus will own the remaining 10%. The two remaining turbines have been respectively acquired by the City of Malmö and the local Kalmar County Council. The wind farm was commissioned in the first quarter of 2017 and is managed and operated by Eolus on behalf of the owners. 1 Mirova-Eurofideme 3 is a closed-end fund no longer raising capital. The Fund has not been authorised by the French Financial Market Authority (“AMF”) nor by any other supervisory authority. The Fund is mainly subject to loss of capital risk. The European Investment Bank (EIB) is the long-term lending institution of the European Union owned by its Member States. It makes long-term finance available for sound investment in order to contribute towards EU policy goals. In 2016 alone, the Bank made available nearly EUR 1.7 bln in loans for Swedish projects in various sectors, including urban development, industry and research. 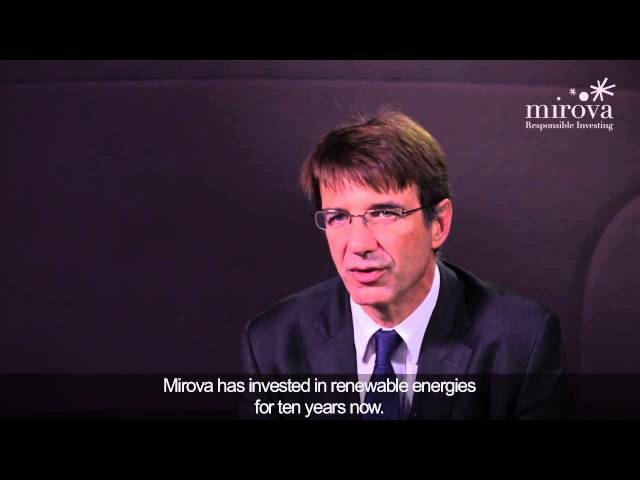 Mirova offers a global responsible investing approach with a single offer revolving around 5 pillars: Equities, Fixed Income, General and Renewable Energy Infrastructure, Impact Investing, Voting and Engagement. With €6.9 billion of assets under management, Mirova brings together over 70 multidisciplinary professionals, including thematic investing specialists, engineers, financial and ESG analysts, and project finance experts. Eolus Vind AB is one of the leading wind power developers in Nordics. Eolus is active in the whole value chain from development of green field projects to construction and operation of wind farms. Founded in 1990, Eolus has constructed more than 500 wind turbines of the approximately 3 300 wind turbines operating in Sweden. Eolus Vind AB has approximately 5 600 shareholders. Eolus shares are listed at Nasdaq Stockholm.